‘Wow!’ said the members as they saw the fabulous spread created to provide a ‘diamond buffet’ on the Saturday night. They had been promised a decent buffet as a safe alternative to a giant barbecue or an impractical silver service. But this was not the array of posh sausage rolls and bits on sticks that they expected. Heidi and her catering team had promised to blow our minds and delighted all present – they did a grand job. Gary, the rugby club manager, had laid on a fine selection of real ales, including Air Force bitter, with the brewery donating 10p for every pint sold to an RAF benevolent society; nice touch. The guest band played an excellent selection of tunes that had all ages from toddlers to ancients upon the dance floor, where they stayed jigging to the disco in-fills between live sets. The marquee outside the patio doors provided a halfway house for the typical good-natured banter and general discussion and a chill-out/quiet room was provided at the other end of the building. An excellent evening of fun and entertainment was enjoyed by everyone and even the threatened rain kept away. At 2am a number of us campers were out in the warm, night time air, listening to the thunder and watching a stunning lightning display about 10 miles to the south. Then at 4am, still with no rain, a most impressive thunderstorm was parked directly overhead, ensuring a main topic of conversation at Heidi’s big Sunday breakfast to prepare us for the free-for-all Open Day. The official start to the diamond weekend was on the Friday morning leading into the bank holiday. There had been dire warnings of gales and torrential rain so we expected a slow start and possibly a number of no shows. 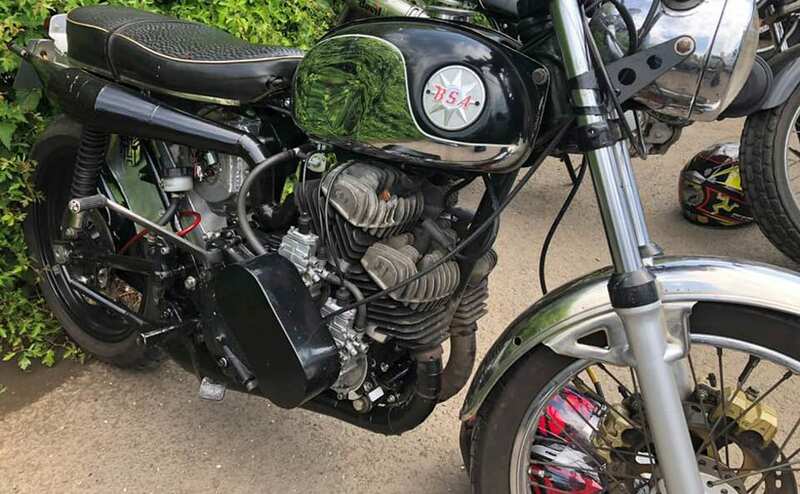 Then it started – the distinctive sound of a thumping Norton as an early arrival on a Norton P11, fully laden with camping gear, rode into the venue, bringing a bright sky with him. The sun shines on the righteous. 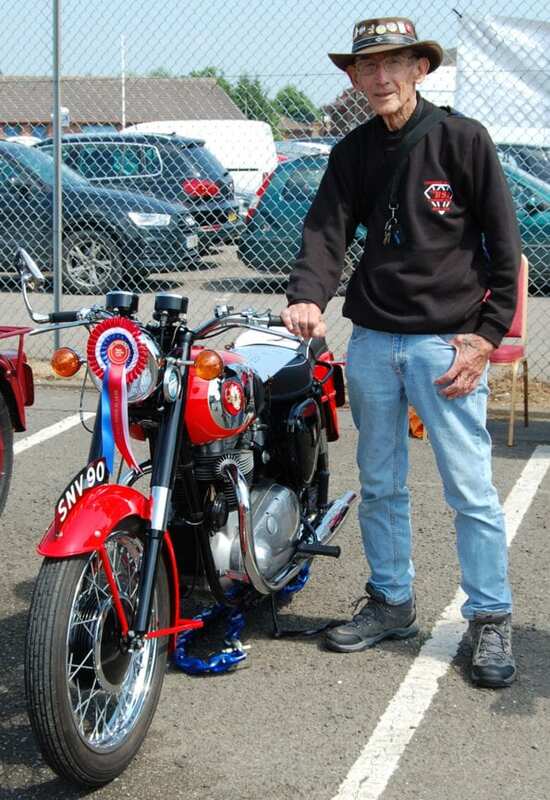 From about 10am right through to late evening there was a constant flow of bikes, vans, camper vans, caravans and all the while building excitement as old and new friends were met and the club’s diamond jubilee shirts and jumpers were collected. The local economy was boosted as more than a few of us went out to replace essential items left behind at home (like a tent with no poles, and an awning with entirely the wrong poles). Heidi and co had prepared a magnificent evening meal; plenty of choices but the undoubted star, to go with the amazing selection of vegetables, was her home-made giant steak and ale pie. Heidi usually has help preparing this pie, but this year it was entirely her own creation and all the better for it. The pie alone justifies membership of the club. Saturday morning started early. By breakfast there were already new arrivals coming in and bikes being fired up and taken out to fill the tanks. Ian and Roger from spares specialist Draganfly arrived with their big van and an even bigger marquee stuffed full of pre-ordered spares, and a good selection showing off the vast range of quality parts they supply. A major attraction was the Craven luggage collection now made in-house by Draganfly and available as off-the-shelf items or fully customised to suit the individual customer and/or their bike. 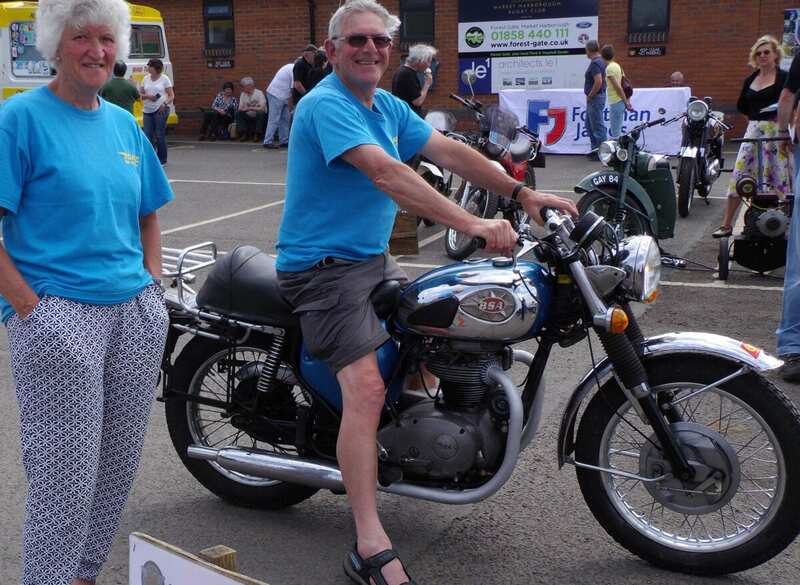 Roger had brought his Ariel to ride while Iain presented his oil-in-frame A65 that he’d only finished recommissioning two days earlier. Graciously, if not confidently, he accepted the club challenge to take it for its shakedown run on the club ride out. 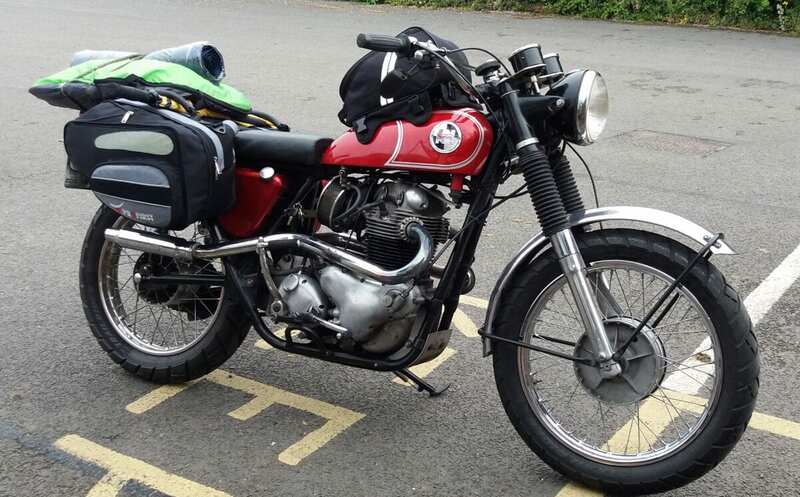 What’s 80 brisk miles to an untested BSA? He would soon find out! At some point in the mayhem, Dave Smith, aka Rupert Ratio, the unit singles supremo, slipped in with boxes of his three excellent books, setting up shop next to the club help-desk, which was equipped with full CAT facilities (no not furry moggies, Computer Assisted Tracing of frames and engines from the factory despatch records), and experts from the international event organisers. It’s Australia this year. 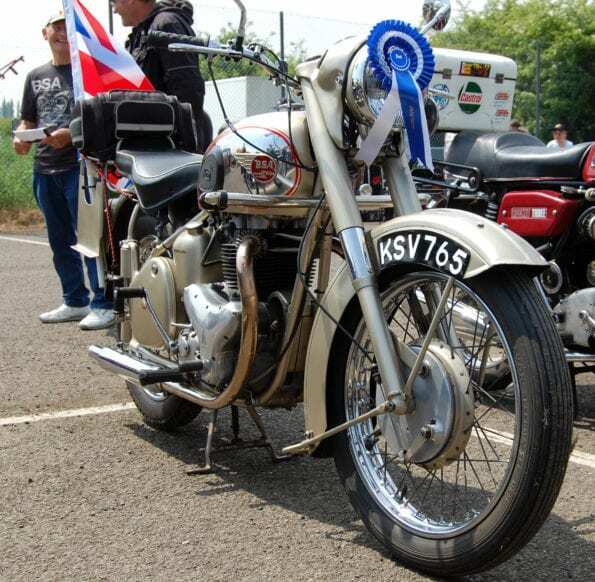 Just before 11 o’clock the cacophony of a BSA mass start-up shook the ground. After a brief safety and orientation session, route maps were issued together with guidance on where to meet for lunch if you got lost. Clearly the look on many owners’ faces confirmed that it was probably years since they last were constrained by the squiggles on a map. Still, how hard can it be to get back to middle England in time for a diamond dinner? The procession of old bikes leaving the site was tearjerkingly beautiful. Sunday dawned a little misty but with the promise of sunshine to prove the Met Office wrong. This is the club’s annual showcase, a free event to attract new people to the marque. Footman James arrived and set up their stall explaining their particular services and offering a wealth of important and impartial classic bike insurance advice to all. Indoors, Heidi and her team were busy with the last of the breakfasts and a constant supply of snacks and coffees, whilst thinking about Sunday night’s dinner. 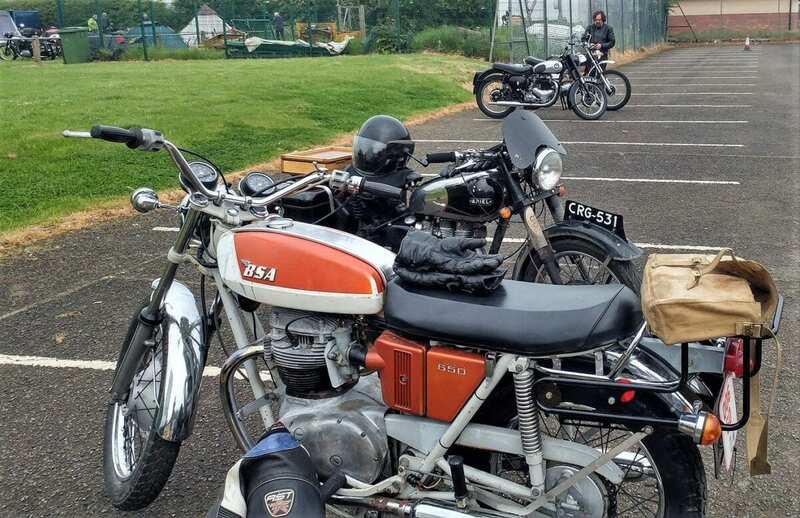 Soon the stream of visitor bikes increased into a deluge, including a welcome contingent of BSAs, as well as a delightfully eclectic selection of old and new bikes of every make and style. There was even a fine example of the ultra-rare Kawasaki W800! 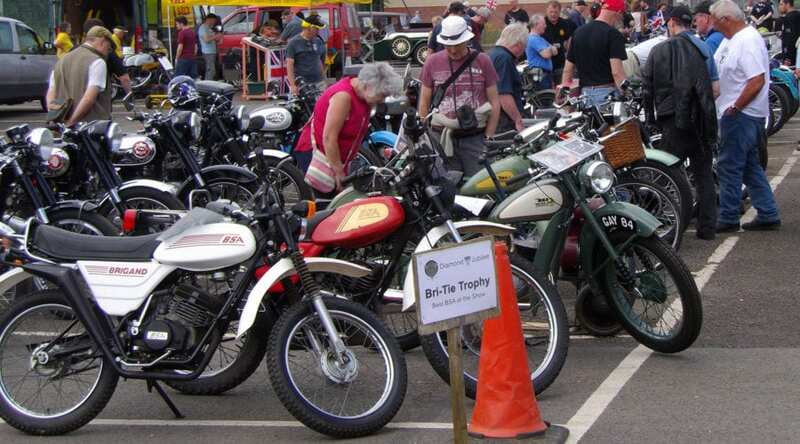 As if by magic, club members stepped forward to volunteer to organise the BSAs into the right groups for judging and the non-BSAs into their own display for admiring. Raffle tickets were being sold in their hundreds and the regular ice cream man was doing his usual roaring trade. Over on the grass, after a gap of many years, the traditional ‘silly games’ were revived and enjoyed by a large crowd and many participants. I’d bet the tradition is re-established. One of the silly games was to reassemble an Amal carburettor against the clock. Easily the best result was that a 13-year-old girl was the fourth fastest at putting together the collection of parts. 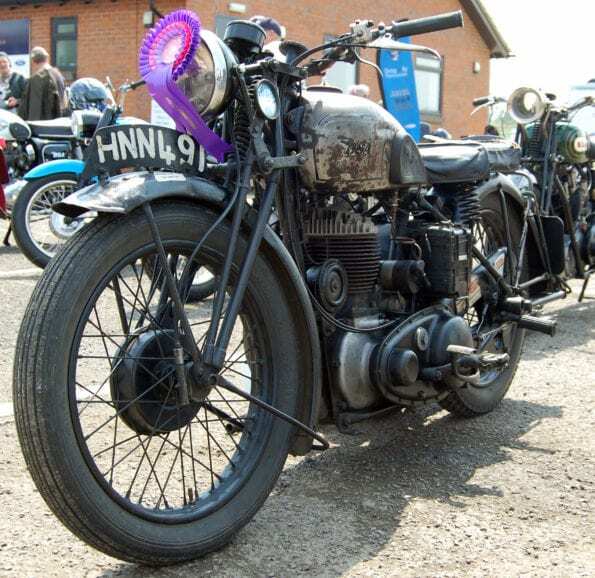 Mid-afternoon was characterised by the annual club awards for a variety of achievements, including an award for the highest mileage ridden to the event being closely contested by a BSA from France and another from deepest darkest Cornwall. This year the best in show award went to a stunning 1958 A10 Super Rocket that is both well-polished and nicely run in since its full restoration. It was Norma’s first official duty as president of the BSA Owners’ Club, but you’d be forgiven for thinking she’s been organising everyone for years! The lucky winners of the raffle were then presented their prizes. There were lots of separate prizes from business and individual sponsors, parasols from Footman James and a major prize of a top box from Draganfly. Eventually, the record number of visitors reluctantly headed off home and club members prepared for dinner and goodbyes to those who had to leave. More members than before had opted to stay for Sunday night and leave on Monday. Book the Spring Bank Holiday weekend for next year, now!